Over the last few weeks I've been playing with a new gadget. None other than the YouView+, the new freeview and smart TV On Demand viewer backed by BBC, ITV, Channel 4, Channel 5, BT, TalkTalk and Arqiva. I'll tell you now it's a fantastic bit of kit, but we'll go through the reasons why I love it during the review! 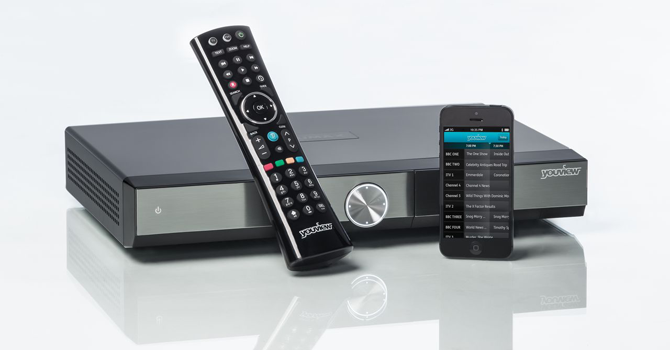 Youview is an internet connected set top box with the all the Free to Air channels and Radio stations from the freeview network you could want. On top of that the set top box has a 500Gb hard disk drive for up to 300 hours of recording. Additionally this set top box is one of the most compatible on the market for televisions of all ages due to it's HDMI, Scart and RCA outputs meaning it'll run with a vast array of Televisions of all ages and types. To set YouView up is a Painless process. You simply connect the box to your TV, connect the Ethernet cable to your broadband router and the box's rear connection, Turn it on and within no times you'll be greeted with a very simple setup, It's designed for anyone to be able to set it up with minimal fuss. Once tuned and updated you're good to go. Here's a video of the UI and general feel of the Youview service. The User Interface (UI) of the YouView box is very advanced, in fact I think it trumps the competitors UI. Once setup the Backwards EPG is blissful to use. It offers you 14 days of options, 7 days in the future so you can add reminders for your favourite shows and the 7 days previous programming with the option to view on demand content direct from the guide itself regardless of the provider. As most* YouView boxes have a hard drive inside you can also record series at the same time as watching another channel thanks to it's dual tuners. Very useful if you want to watch both Almost Naked Animals and Andy's Wild Dinosaur Adventures and they're on at the same time. Parent's rejoice. The YouView box has parental controls. While I've yet to experiment with them I've been told they work fantastically from other users. The mobile app is pretty good. I've only used it a few times I can record or set reminders while I'm out and about. I've tried it so far on 3g, the local bus company bus wifi and at home and it works pretty well. With adding a device being an absolute doddle even the kids can do it. The Box itself is a very good looking device with a brushed steel effect on the front of the box with capacitive touch sensitive power button and menu key, Hidden under a flap on the right hand side is a USB port. I feel they missed a trick here as I think they should have included a smartcard slot for Internet providers to use to add their own TV Services, but not a major disaster nonetheless. On the rear of the Device we have the full array of ports as shown on the image below. These ports include RF in/out, USB, Scart, HDMI, SPDIF, RCA AV OUT, power and Ethernet. I now I've mentioned this before but with such an array of ports compatible with the vast majority of older and more modern Televisions it's a very wise choice for those not with an older CRT or early LCD TV knowing the TV they have is 90% sure to work without hassle. Also if they choose to upgrade to a newer television it'll still work fantastically. In conclusion the Youview+ boxes are a fantastic bit of kit. With a plethora of channels and entertainment for all the family it's a perfect choice for those who want a quality experience without the monthly subscriptions. Additonally the mobile app for IOS and Android works seamlessly to make the whole experience a breeze.I will probably buy another one for the bedroom in the future. If you have any questions please drop them below and I'll respond asap. *A model with a single tuner and no hard disk drive has been released recently by Huawei and seems to be exclusively available to TalkTalk essential customers at the moment. Now if you want your own YouView or YouView+ Box I can help you out. You'll need to make sure with your internet service provider that you are on an unlimited package to ensure you don't incur added costs for more bandwidth. Also make sure your provider can give you download speeds of 3mb as a minimum. Otherwise it may not work too well.